Just a note or two at the start- I am sparse with details in this piece since the screening at the New York Film Festival was the first time anyone has seen it and I don't want to poil anything just yet. Also a longer more detailed review is coming later- this was written because I had to write something and express my thoughts, passion and enthusiasm before it was lost to careful consideration. Keep in mind it was written in a fugue state. Paul Schrader sneak previewed his FIRST REFORM at the New York Film Festival some seven months before it's US release- and the result was screening that ended with gasps, applause and the desire to spend the next two weeks talking about the film. The film, which concerns a minister in a historic church in Upstate New York who has a crisis of faith and has to wrestle with demons, is a messy masterpiece. The film is clearly Schrader firing on all cylinders and making the film he wanted to make. It is deep discussion on the nature of faith, belief and what God wants from a man who has been pondering the question for the better part of the last half century. If the film looks and sounds familiar it is because Schrader is in a way summing up. Openly pulling from a variety of sources and filmmaker Schrader is filtering everything he has wanted to say about all of the film's themes in one package. Schrader indicated at the post screening Q&A that a conversation with Pawel Pawlikowski, the director of IDA, that now was the time to make the film on faith that he always wanted to and he attacked it with wild abandon. Schrader has made a one of a kind film. It's a film that you either go with, especially in the third act or you don't. Schrader is challenging us to go with him no matter how silly a couple of scenes are. He seems to know that not everyone will go with him but he is betting most will. There were some laughs at a couple of things but in the end the film was met with thunderous applause. Schrader wonderfully upsets expectations. Where he goes and why is rarely where we expect. I don't think anyone was expecting the ending or the journey of how we get there. Schrader subverts our notions of storytelling and forces us to engage or "die". Talking after the film I said this was the ballsiest film at the New York Film Festival this year and Nora Mandel suggested THE SQUARE and it's off beat scenes might, but I don't think so. To me THE SQUARE is a very messy and unfocused button pusher. Scenes like the dinner party, the You Tube video or the Tourettes while effective are much too calculating. Director Ruben Ostland is simply trying to provoke a reaction in scenes which aren't fully connected to the narrative. He wants the audience to react. 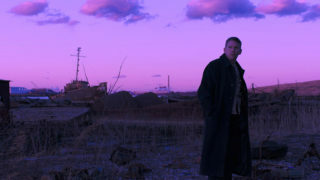 In FIRST REFORMED Paul Schrader wants the audience to think. He is telling you a tightly wound story and he is doing it his way. He is well aware the film isn't going to work for everyone but he won't change his story to win people over. I need to see the film again, preferably right before a dinner with the entire Unseen Films family because I want to see and hear the discussions that result. One of the first things Paul Shcrader said was that the film was going to be the subject of years of college papers- oh hell yea.People will be talking about this for years. I am floored. It is a film that you can not ignore. It is a film you must see and must engage with. This was one of the coolest screening I've ever attended because just being part of the audience which had no expectations and got to react to the film blindly was just magical. One of the best film at this year's New York Film Festival and of 2017. More thoughts will follow down the road when it's not after midnight and not when I have to get up at 6AM.